Twenty-seven commemorative US stamps were issued between 1954 and 1956. That makes an average output of about nine commemorative stamp issues per year, far less than some previous years. The 3 C. denomination stamp shown above, at the left (Sc. #1029), was issued on January 4, 1954 to commemorate the 200th Anniversary of Columbia University. The design features the Low Memorial Library at Columbia University in Morningside Heights, Upper Manhattan, New York City. Columbia University was originally founded as Kings College, under a charter from King George II in 1754. It was renamed to Columbia College in 1784. The 3 C. denomination stamp shown above, at the right (Sc. #1060), was issued on May 7, 1954 to celebrate the 100th Anniversary of the Establishment of the Nebraska Territory. The design features The Sower, the statue on top of the State Capitol in Lincoln, Nebraska, sculpted in 1929 by Lee Oskar Lawrie (1877-1963). Also shown are images of Mitchell Pass, Nebraska and Scotts Bluff, Nebraska. The 3 C. denomination stamp shown above, at the left (Sc. #1061), was issued on May 31, 1954 to celebrate the 100th Anniversary of the Establishment of the Kansas Territory. The design features a wheat field and a pioneer wagon train. The 3 C. denomination stamp shown above, at the right (Sc. #1063), was issued on July 28, 1954 to celebrate the 150th Anniversary of the Lewis and Clark Expedition. The design of these US stamps depicts Meriwether Lewis (1774-1809), William Clark (1770-1838), and Sacagawea (1788-1812) making landfall along the Missouri River. The Lewis and Clark Expedition, also known as the Corps of Discovery Expedition, was commissioned by President Thomas Jefferson, with the purpose of exploring the recently acquired Louisiana Territory. The expedition lasted from May 1804 to September 1806. It was led by a select group of U.S. Army volunteers, under the command of Captain Meriwether Lewis and Second Lieutenant William Clark. The primary objective of the expedition was to explore, map, and establish an American presence in the new territory. The secondary objective was to study the area's plants, animal life, geography, and to establish trade with the local Indian tribes. The expedition began in St. Louis, then followed the Missouri River, the Yellowstone River, the Snake River, and finally the Columbia River, reaching the Pacific Coast in what is now the State of Oregon. The 3 C. denomination stamp shown above, at the left (Sc. #1064), was issued on January 15, 1955 to celebrate the 150th Anniversary of the Pennsylvania Academy of the Fine Arts. The design features the 1822 self-portrait of Charles Wilson Peale (1741-1827) in his museum. Peale is remembered for his portrait paintings of leading figures of the American Revolution and for establishing the Philadelphia Museum, one of the first art museums in America. The 3 C. denomination stamp shown above, at the right (Sc. #1068), was issued on June 21, 1955 to celebrate the 150th Anniversary of the Discovery of the "Old Man of the Mountains" in New Hampshire. The "Old Man of the Mountains" or the "Great Stone Face" was a series of five granite cliff ledges on Cannon Mountain in the White Mountains of New Hampshire that were first observed in 1805. The cliff collapsed on May 3, 2003, destroying the natural-wonder. The 3 C. denomination stamp shown above, at the left (Sc. #1065), was issued on February 12, 1955 to celebrate the 100th Anniversary of the founding of the First Land-Grant Colleges. The design features an open book, along with the names of Michigan State College and Pennsylvania State University, the first two Land-Grant Colleges. The 8 C. denomination stamp shown above, at the right (Sc. #1066), was issued on February 23, 1955 to celebrate the 50th Anniversary of the Rotary International, a service organization whose purpose is to bring together business and professional leaders to provide humanitarian services and to promote peace and goodwill in the World. 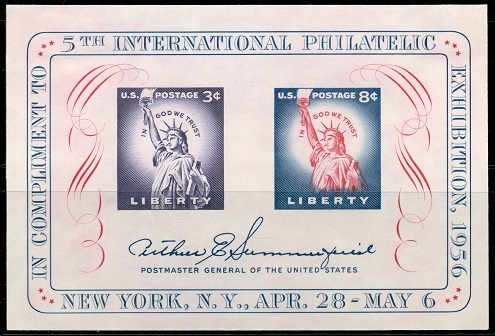 The design of these US stamps features the Torch of Liberty, the World Globe, and the Rotary emblem. The 3 C. denomination stamp shown above, at the left (Sc. #1067), was issued on May 21, 1955 to honor the Armed Forces Reserve. The design features Marine, Coast Guard, Army, Navy, and Air Force personnel. The 3 C. denomination stamp shown above, at the right (Sc. #1069), was issued on June 28, 1955 to celebrate the 100th Anniversary of the Soo Locks and Great Lakes Transportation. The Soo Locks are parallel locks that enable travel between Lake Superior and the Lower Great Lakes. The 3 C. denomination stamp shown above, at the left (Sc. #1070), was issued on July 28, 1955 to promote the theme of Atoms for Peace. The design features atomic energy encircling the hemispheres. The 3 C. denomination stamp shown above, at the right (Sc. #1071), was issued on September 18, 1955 to celebrate the 200th Anniversary of Fort Ticonderoga, New York. The design features a map of the fort, Ethan Allen, and artillery. Fort Ticonderoga is a large, 18th Century fort constructed by the French near the South end of Lake Champlain, New York. On May 10, 1775, the fort was captured by a group of Green Mountain Boys, led by Ethan Allen (1738-1789) and Colonel Benedict Arnold (1741-1801). The armaments were looted and taken to Boston, where they were used to break the British siege there. The 3 C. denomination stamp shown above, at the left (Sc. #1074), was issued on April 5, 1956 to celebrate the 100th Anniversary of the Birth of Booker T. Washington. The design features a rendition of the log cabin, where Booker T. Washington (1856-1915) was born as a slave. He went on to become a successful educator and the founder of the Tuskegee Institute in Alabama. The 3 C. denomination stamp shown above, at the right (Sc. #1076), was issued on April 30, 1956 to publicize the Fifth International Philatelic Exhibition. The design of these US stamps features the New York Coliseum and the Columbus Monument. The imperforate souvenir sheet shown above (Sc. #1075) was issued on April 28, 1956 for the Fifth International Philatelic Exhibition (FIPEX), held in New York City from April 28 through May 6, 1956. This souvenir sheet features reproductions of the 3 C. and 8 C. denomination definitive US stamps, issued during 1954. A number of countries around the World also issued stamps and souvenir ephemera for FIPEX, thus a collection of all these issues could result in a thematic specialty in itself. The 3 C. denomination US stamps shown above (Sc. 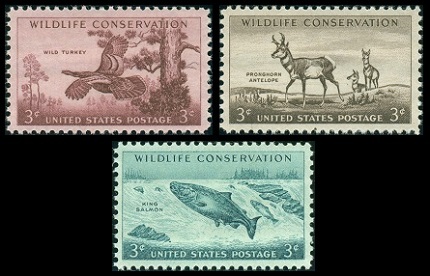 #1077-79) were issued during 1956 to emphasize the importance of Wildlife Conservation in America. 03 C. (Rose Lake) - Wild Turkey. 03 C. (Brown) - Pronghorn Antelope. 03 C. (Blue Green) - King Salmon. The 3 C. denomination stamp shown above, at the left (Sc. #1081), was issued on August 5, 1956 as a tribute to Wheatland, the Lancaster, Pennsylvania home of President James Buchanan (1791-1868). Wheatland was purchased by a foundation in 1934, whose purpose was to preserve the historic landmark. Wheatland became a national historical landmark in 1961. The 3 C. denomination stamp shown above, at the right (Sc. #1083), was issued on September 22, 1956 to celebrate the 200th Anniversary of Nassau Hall at Princeton University in New Jersey. The design features a view of Nassau Hall. At the time it was built, Nassau Hall was the largest building in colonial New Jersey, and the largest academic building in all the American colonies. The 3 C. denomination stamp shown above (Sc. #1085) was issued on December 15, 1956 as a Children's Stamp to promote Friendship among the Children of the World. The design of these US stamps depicts Children of the World, along with the slogan Friendship - The Key to World Peace. The 3 C. denomination stamp shown above (Sc. #1062) was issued on July 12, 1954 to celebrate the 100th Anniversary of the Birth of George Eastman. George Eastman (1854-1932), an American innovator, entrepreneur, and philanthropist, was the inventor of photographic dry plates, flexible camera film, and the Kodak camera. In 1892, he founded the Eastman Kodak Company in Rochester, New York, one of the first firms to mass-produce standardized photographic equipment. The 3 C. denomination stamp shown above (Sc. #1072) was issued on December 20, 1955 to celebrate the 100th Anniversary of the Birth of Andrew Mellon. Andrew Mellon (1855-1937) was a prominent American banker, businessman, industrialist, philanthropist, and art collector. He was the United States Ambassador to the United Kingdom from 1932 to 1933, and the United States Secretary of the Treasury from 1921 to 1932. The 3 C. denomination stamp shown above (Sc. #1073) was issued on January 27, 1956 to celebrate the 250th Anniversary of the Birth of Benjamin Franklin (1706-1790). The design features the famous 1816 painting, Franklin Drawing Electricity from the Sky, by Benjamin West (1738-1820). The 3 C. denomination stamp shown above (Sc. #1080) was issued on June 27, 1956 to celebrate the 50th Anniversary of Pure Food and Drug Laws. The design features Harvey Washington Wiley (1844-1930), an American chemist, noted of his leadership in the passage of the Pure Food and Drug Act of 1906. The 3 C. denomination stamp shown above (Sc. #1082) was issued on September 3, 1956 in celebration of Labor Day. The design features a mosaic from the AFL-CIO Headquarters in Washington, D.C. The 3 C. denomination stamp shown above (Sc. #1084) was issued on September 24, 1956 to celebrate the 50th Anniversary of the Devil's Tower National Monument. The design shows a view of Devil's Tower in Wyoming.